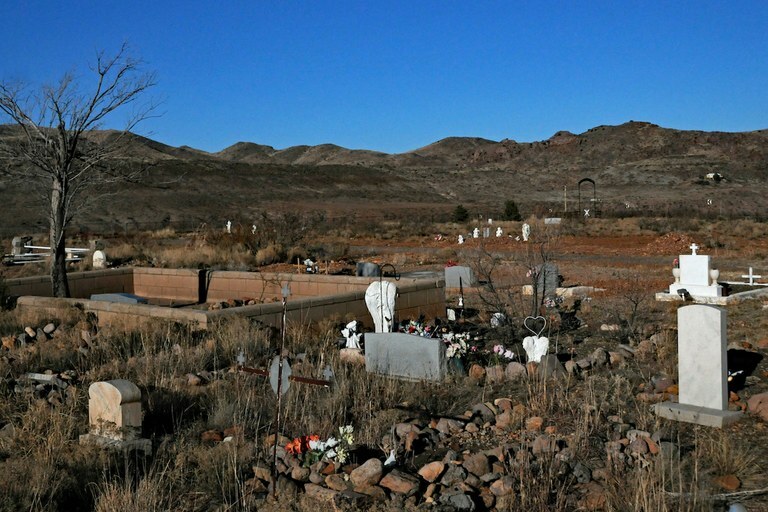 Hillsboro and Kingston, tiny mountain towns on the edge of the Gila National Forest in southern New Mexico, have a rare quality. It comes from the night skies. The stars shine bright at this elevation. The nearest city lights are 31 miles from Hillsboro, in Truth or Consequences. It comes from the mountains — rocky, rugged peaks that the Apache people once called home, that people mined for silver and gold in the 19th century, that today aren’t visited by many humans. More than anything it comes from the people — an ideologically diverse group of folks who come together to sustain these towns through volunteerism and celebration of arts, music, history and culture. While many small towns agonize over how to attract a younger generation and the change that they might bring, often by speeding up or expanding internet access and cellphone reception, many residents in Hillsboro and Kingston are instead focusing on sustaining the unique existence that drew them here in the first place. Whether that can last is an open question. There are challenges to overcome, like these communities’ aging populations. A steady stream of younger retirees and second-home owners replace older folks who die or move and help keep the towns afloat. And while many say they’re open to — even enthusiastic about — faster internet service, which could improve some of their activities and attract younger folks, better cellphone reception has drawn opposition. In short, many residents say they’re open to better technological connectivity as long as it doesn’t change the character of Hillsboro and Kingston. 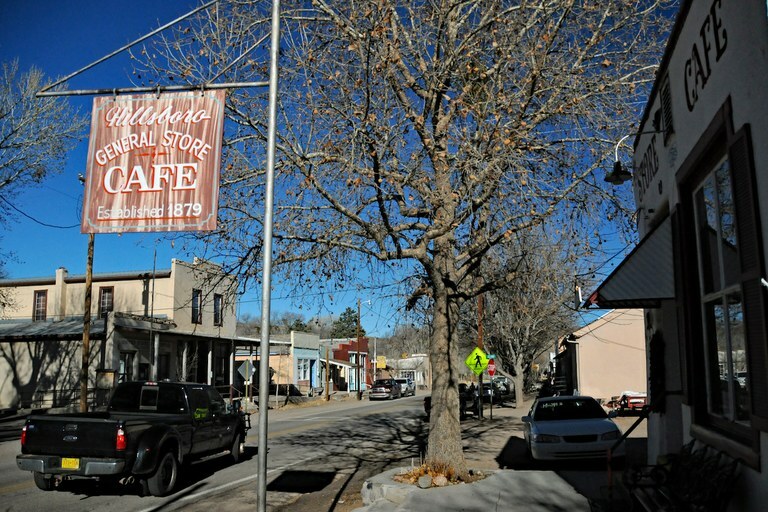 A view of the main street through Hillsboro, N.M. Highway 152, from the General Store Cafe. As the world changes, some rural towns will adapt and survive. Others will not. Hillsboro and Kingston are currently seeking a different path, one that allows them to survive in spite of being less connected to society. Many of their residents hope to preserve their way of life through that off-the-beaten-path character. An old playground sits on a hill above the Hillsboro Community Center. Perhaps when grandkids or tourists are visiting, people occasionally trek past the building that used to be a school, up worn steps overgrown with weeds, to use the wooden swings and other squeaky equipment. A sign at the entrance warns that people use the playground at their own risk. Today, Hillsboro is much different than the days when enough children lived in the region to fill a school, an apple festival drew thousands of people to the town every Labor Day weekend, and there was enough life to support a motel, gas station, bank and bar. 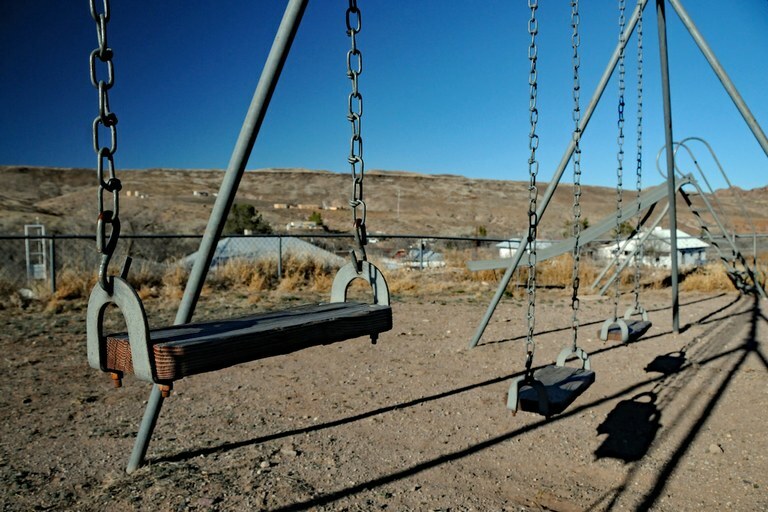 Today only nine children living in the area attend public schools in Truth or Consequences. The youngest is in middle school, the school district says. A view of Hillsboro from an old playground above the community center, which used to be a school. But today’s Hillsboro is a vibrant community in its own, unique way. It has largely become a place for retirees and people who can afford second homes: A former New Mexico lieutenant governor and an episcopal priest who was once dean of a branch of the divinity school at Yale University are among the homeowners. Some residents assert that Hillsboro may be home to more Ph.D.s per capita than Los Alamos County, the home of Los Alamos National Laboratory and one of the highest concentrations of Ph.D.s in the United States. Hillsboro, population 124, and Kingston, population 32, are unincorporated. County government is housed in Truth or Consequences, 31 miles from Hillsboro and 40 miles from Kingston. Residents here have turned a lack of government into a strength by tapping into their collective experience, knowledge and time to build a culture of volunteerism that powers much of what this community does. A community center, library, historical society and museum are run by nonprofits. There’s a water board and a volunteer fire department. There are concerts and other frequent public events. Residents show off their homes during a holiday tour each year. O’Dell likes it that way. The owner of Black Range Vineyards and its tasting room in Hillsboro said formal government decision-making might cause people to divide and fight. The current dynamic forces people to come together and solve problems in a proactive manner. Jan Haley, another longtime Hillsboro resident, agreed. And, she said, people help each other out. Haley is aware that the aging population of these communities may threaten that existence. “We need people, even in their 40s or 50s, to come here,” said Haley, who began visiting Hillsboro in the 1990s and eventually bought a home here. These days she and her husband spend 80 percent of their time in Hillsboro, she said. 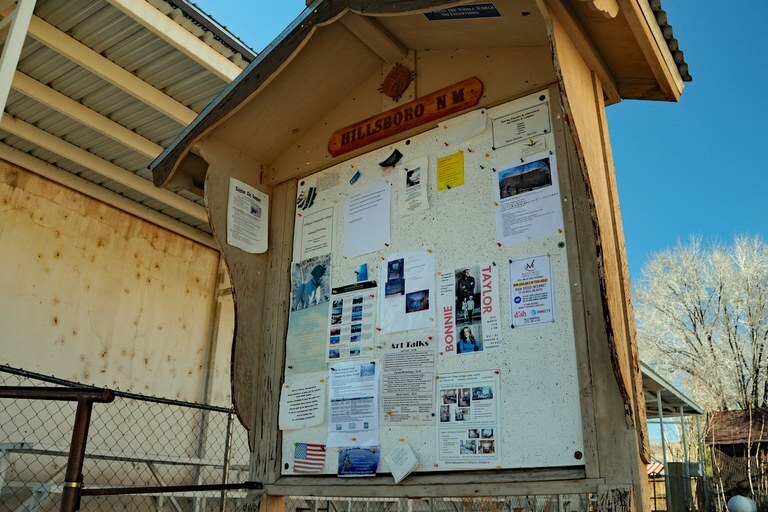 A community message board near the post office in Hillsboro. The companies that provide internet service in Hillsboro all offer roughly the same speed, residents say: fast enough to stream movies, but not in high definition. And with the exception of a few spots in Hillsboro and Kingston where people can pick up a weak Verizon signal — most notably the cemetery on a hill above Hillsboro — there’s no cellphone service. That makes the speed at which people in urban centers consume media, communicate with each other online and conduct business impossible in Hillsboro and Kingston. During a recent interview at her wine tasting room, O’Dell pointed out the community boards across the street in front of the post office and a shop. Flyers highlight upcoming community meetings and other events. “There’s our social media,” she said. That’s part of the draw for many. Several people said they like that those who gather at the wine tasting room, the General Store Cafe or other places are having face-to-face conversations instead of staring at mobile devices. Catherine Wanek, the owner of the Black Range Lodge in Kingston, also wants faster internet. She has explored options, including putting a relay tower for a company on her property, but none have materialized. Some residents have opposed Wanek’s efforts. While satellite internet service has improved in Kingston in recent months, speeds “still do not match the city,” Wanek said, “and I guess we’re willing to live with that limitation.” Still, the lodge built a sound stage last year and started a summer concert series, and Wanek wants fast enough internet to stream those events online. That slower pace is why Wanek is “not eager” to see better cellphone service in Kingston. Former New Mexico Lt. Gov. Diane Denish started visiting Hillsboro in 1994, the first time she ran for that office. She and her husband Herb made friends here and visited regularly. They bought a home in Hillsboro in 2003 and have been part-time residents ever since. 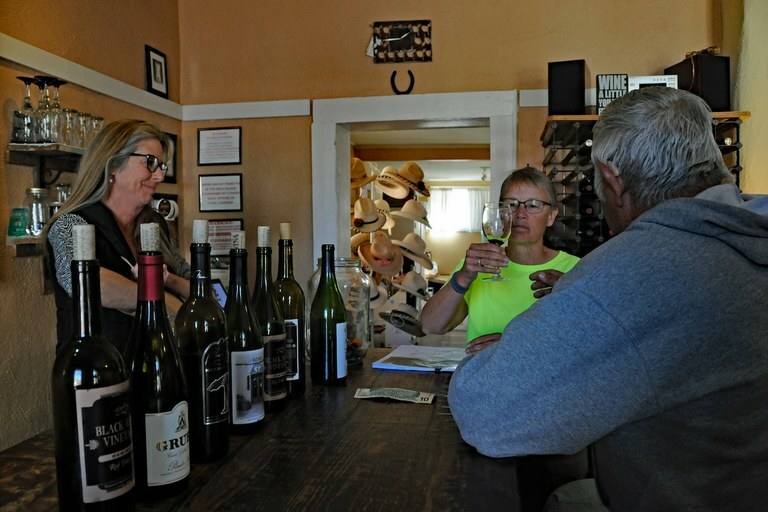 Barb Payla of Minnesota samples wine at the Black Range Vineyards tasking room in Hillsboro with her husband George on a Monday afternoon in March. At left is Nicki O’Dell, the winery’s owner. During her eight-year stint in public office, which ended in 2010, Denish visited Hillsboro when she needed a break from politics. She recalls getting questions from the state police about how to reach her if she was needed. She assured them she had a landline. Though the internet in Hillsboro is fast enough for Denish’s needs, she said she would welcome better internet as “an absolute necessity” for attracting younger people. But she doesn’t want better cellphone service, and she has opposed such efforts in the past when people have asked her about helping get a cellphone tower in town. Haley agrees. She’s OK watching Netflix and HBO without the high-definition quality she could get other places. She’s figured out how to use her cellphone in her home by connecting it to Wi-Fi. She’s fine with her cellphone not working when she’s around town. The Rev. Joe Britton, an Episcopal priest in Albuquerque, first visited Hillsboro on his honeymoon in 1982. They bought a second home in Hillsboro in 2006. They were living in Connecticut at the time. Britton was dean of the Berkeley Divinity School, the Episcopal seminary at Yale University, where his wife still teaches architectural history. For his purposes, Britton said the technological connectivity “works as is.” But he understands the tenuousness of Hillsboro’s situation. The current internet speed in Hillsboro is an impediment to Travis Perry’s work. The biology professor at Furman University in South Carolina spends about half his time in New Mexico researching mountain lions at three sites, including in the Black Range near Hillsboro and Kingston. He and his wife Megan own a home in Hillsboro. Perry said he loves the location, the small size of the town, and its residents. The only downside, he said, is the internet. His research involves uploading and downloading hundreds or thousands of photos to a remote server in a session from cameras placed at mountain lion study sites. He’s explored internet options in Hillsboro and currently uses the internet and phone company Windstream, “but unfortunately, this is likely not fast enough for my needs,” he said. 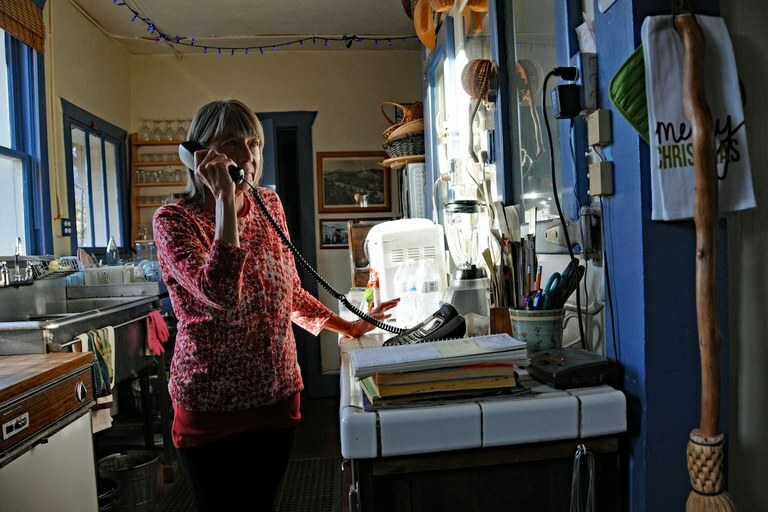 Catherine Wanek, the owner of the Black Range Lodge, wants faster internet in Kingston, which not all residents support. “This may be a real problem this summer as I’ll have two research students staying at the house in Hillsboro who will be relying on this photo data capture for their work,” Perry said. Hillsboro resident Bob Barnes also has issues, but he’s found what for him is an acceptable workaround. Barnes publishes several websites about the history of the Black Range and other adventures. He uploads videos to the sharing website Vimeo. He can upload most from Hillsboro. When a file is too large, he puts it on a thumb drive and visits his brother in Deming, who has broadband internet through Comcast, and uploads the file there. Faster internet in Hillsboro “would make a world of difference,” Barnes said. But he used to install fiber optics on transmission lines for a utility company in Oregon, and said he understands the financial challenge of a company recouping the cost of such an investment with so few residents. Regardless of whether residents want it, the challenge of expanding or improving connectivity in Hillsboro and Kingston could be insurmountable in the short-term. Corporations often won’t make such investments without government assistance. Verizon has no plans at this time to add coverage in the area around Hillsboro and Kingston, spokeswoman Jeannine Brew said. New Mexico’s Public Regulation Commission is implementing a program to help companies expand broadband access in rural areas. Starting this year, part of a fee on landline and cellphone bills will be used to create a $5 million fund for that purpose. Companies can apply through a competitive process for money to pay for a portion — but not all — of the costs of expanding broadband to unserved or underserved areas. Windstream, one of the internet providers in Hillsboro — whose service doesn’t extend nine miles up the road to Kingston — is interested in the grant money. But don’t expect it to benefit Kingston. “In remote rural areas like Kingston, there is no rational business case for broadband expansion or improvement due to the high cost and inordinately long cost-recovery periods,” said Windstream spokesman Scott Morris. Other states have built larger funds to assist companies with rural broadband investments, said the PRC’s Jones. Nebraska’s fund is tens of millions of dollars each year, Jones said. California’s is even larger. Jones said he hopes New Mexico’s initial $5 million investment will benefit a few rural communities and convince the state legislature to “commit some real money to it” down the road. It’s “hard to extrapolate lessons” for most other rural communities from Hillsboro and Kingston because of the unique circumstances here, said Chris Mehl with Headwaters Economics in Montana, a nonpartisan research firm specializing in research and analysis for rural communities in the western United States. The tiny populations and the core group of volunteers who power these communities give them the ability, at least currently, to sustain their situation. It’s possible younger retirees and second-home owners will continue to sustain the towns into the future, even without dramatic changes like better technological connectivity. Through word-of-mouth, these towns largely attract people with financial security who aren’t moving for jobs. As Hillsboro and Kingston lose perhaps a few people each year, it only takes a handful of new residents to sustain current levels, Mehl said. “It’s a niche, so they have a bond both with the others that are there and they have a bond with the lifestyle,” Mehl said. The cemetery on a hill just south of Hillsboro is the best spot in town to get cell phone reception. Residents sometimes drive there to make calls. But he cautioned that it’s a fragile balance. The loss of a few residents, depending on who they are, could have a dramatic impact. A major event like a fire could unsettle their existence, though Kingston survived the 2013 Silver Fire without losing any structures, and both towns survived flooding that followed, which Mehl called “remarkable resiliency” for such small communities. Barnes doesn’t seem concerned about the future. He pointed to the reality that as older retirees die new ones tend to replace them. The next morning they saw a house that was for sale and made an offer before leaving for Tucson. They got the house. O’Dell was similarly charmed. She mentioned the artists, writers, musicians and gatherings in Hillsboro and Kingston. When they discovered Hillsboro, she and her husband were living 80 miles south in Las Cruces, where they started NM Vintage Wines in Mesilla. They bought their Hillsboro home in 2006, became full-time residents in 2012 and sold Vintage in 2016. Now O’Dell operates one of Hillsboro’s primary gathering spaces, in a historic building that’s also been a hospital and hotel in its lifetime. With that long view of how Hillsboro has changed in mind, O’Dell said time may be its own solution. Young people will move in, she believes. They’ll want better technological connectivity. And these communities will figure out how to address that issue like they have others. Heath Haussamen runs the news organization NMPolitics.net. Reach him at [email protected] or on Facebook.